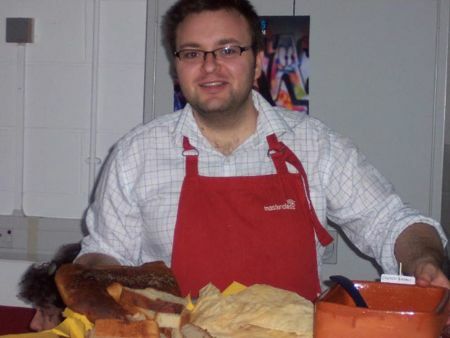 Rami Okasha rustled up a taste of Egypt for World Food Day. Here he gives his recipe for Felafel and makes it sound very simple. That’s Rami in the picture on the right busy dishing up to the stream of people arriving for lunch at Out of the Blue Drill Hall (Ellie and Maka are on the left). You can use either chickpeas (Turkish, Israeli) or broad beans (Egyptian). Soak the chickpeas overnight, covered by about 2-3 inches of water. Next day, drain well and put in a food processor and blend the chickpeas with the garlic and salt. Transfer to a bowl. Finely chop the onion and process with the spices and half the herbs, stalks removed. Add to the chickpeas. Finely chop the remaining herbs. Sprinkle flour and mix. Chill for an hour. Then form into small balls. Line a baking tray with baking parchment. Space the balls so they don’t touch. Bake at 200C for 20-30 minutes. Halfway through, shake the tins so the felafel roll about. Serve with hummus, harissa & garlic yoghurt in a pitta bread. 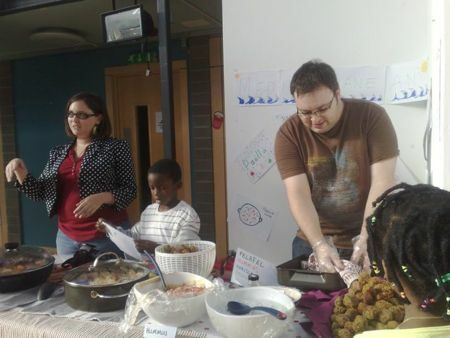 Editor’s note: Rami by the way is a founder member of Leith Open Space and we seem to remember he was the one who first had the great idea of inviting people to bring multicultural dishes to our first Open Space event very nearly six years ago.